The performances of factor investing rely heavily on short sales, not only for building the initial long-short strategy, but also for regularly rebalancing the positions. Since short selling is subject to both legal restrictions and substantial costs, this paper examines how severely restrictions on short positions affect the financial attractiveness of factor investing. To fill the gap between unconstrained long-short allocations and restricted long-only portfolios, we consider two in-between strategies: the first imposes that only the market can be shorted, and the second is the so-called “130/30” scenario that caps total short exposure at 30%. The takeaways are twofold. First, any infringement to the long-short strategy can harm significantly the mean-variance performances of efficient factor-based portfolios. This is linked to the fact that the total short exposure of optimal long-short portfolios can reach figures around 400% and above. Second, the factor portfolios built originally by Fama and French (1992) with the purpose of developing asset pricing are impressively clear-sighted when it comes to portfolio management. Indeed, combining these portfolios generates mean-variance performances similar to those of optimized long-short portfolios, except for low levels of volatility. "A sizeable literature on portfolio management suggests that making short sales on a regular basis to rebalance portfolios is difficult. The aim of this paper is to assess the actual dependence of the mean-variance performances of factor investing on short selling restrictions. In order to relax the necessity of short selling in factor investing, we proceed in two steps. First, we disentangle the long and short legs of the five historical factors. The ten resulting long-only factors provide additional flexibility in portfolio management. Second, short-selling restrictions, if any, are imposed separately on each of these ten factors. Last, we consider short-selling restrictions on the market index separately to reflect that shorting the market is much easier to implement (through derivative markets, for instance) than shorting any other factor. Using as a benchmark the efficient frontier built from the Fama-French portfolios, we will examine the consequences on mean-variance performances of imposing five sets of short-selling-based restrictions. Portfolios in group 1 (global long-only) exclude any short position whatsoever. Group 2 (longshort market + long-only factors) puts no restriction on exposure to market but excludes short positions in factors. The rationale is that easy access to index trading makes shorting the market easier and less costly than shorting factors, which are hardly tradable. Group 3 includes the typical 130/30 portfolios defined by the combination of a 130% long position and a 30% short one. Finally, in group 4, no position is constrained. Figure 1 shows our five efficient frontiers. It reveals that the expected dominances are logically represented graphically. From definitions, we expect that the frontier corresponding to the global long-short case (group 4) dominates all the others, including the benchmark, since it allows running fully unconstrained optimization. 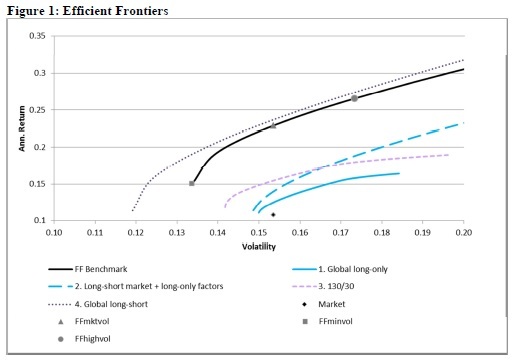 Likewise, the global long-only case (group 1) is evidently more restrictive than both the cases of the long-short market + long-only factors (group 2) and 130/30 (group 3), which implies that the frontier associated with group 1 must be dominated by the two others. There is no clear dominance to be expected between the frontiers corresponding to groups 2 and 3, since on the one hand the exposure to market is unconstrained in group 2 but constrained by the 130/30 restriction in group 3, and the other factors can be shorted (to a certain extent) in group 3 but not at all in group 2. Hence, comparing the frontiers obtained for groups 2 and 3 can bring insights on the trade-off arising from shorting the market only versus shorting single-legged factors. The market portfolio is located below all our frontiers of interest; even the most restricted one (corresponding to group 1), which bans any short sale." Title: Are Exchange-Traded Funds Harvesting Factor Premiums? Some exchange-traded funds (ETFs) are specifically designed for harvesting factor premiums, such as the size, value, momentum and low-volatility premiums. Other ETFs, however, may implicitly go against these factors. This paper analyzes the factor exposures of US equity ETFs and finds that, indeed, for each factor there are not only funds which offer a large positive exposure, but also funds which offer a large negative exposure towards that factor. On aggregate, all factor exposures turn out to be close to zero, and plain market exposure is all that remains. This finding argues against the notion that factor premiums are rapidly being arbitraged away by ETF investors, and also against the related concern that factor strategies are becoming ‘overcrowded trades’. "This paper investigates if factor premiums, such as the size, value, momentum and low-volatility premiums, are systematically being harvested by investors in exchange-traded funds (ETFs). Using a comprehensive sample of US equity ETFs, this paper finds that there are many funds which offer a large positive exposure to target factors such as size, value, momentum and low-volatility. At the same time, however, there are also many funds which offer a large negative exposure towards these factors. On aggregate, the exposures towards the size, value, momentum and low-volatility factors turn out to be very close to zero. The take-away from these results is that despite a large variation in factor exposures across funds, the only thing that remains when everything is added up is plain market beta exposure. This finding argues against the notion that factor premiums are rapidly being arbitraged away by ETF investors. It also argues against the related concern that factor strategies may have become ‘overcrowded trades’. Many investors are concerned about overcrowding of factor strategies, although the concept is not clearly defined. The general idea behind factor overcrowding is that so many investors are chasing the same factors that the long-term premiums associated with these factors disappear, that valuations of the stocks in factor portfolios increase, and that correlations among the stocks in factor portfolios increase as well, which might result in elevated crash risk. As, from a factor investing perspective, there seems to be just as much ETF money chasing stocks with the wrong factor characteristics as ETF money chasing stocks with the right factor characteristics, the ETF market does not seem to justify factor overcrowding concerns." Title: Are Hedge Funds on the Other Side of the Low-Volatility Trade? The low-volatility anomaly is often attributed to limits to arbitrage, such as leverage, short-selling and benchmark constraints. One would therefore expect hedge funds, which are typically not hindered by these constraints, to be the smart money that is able to benefit from the anomaly. This paper finds that the return difference between low- and high-volatility stocks is indeed a highly significant explanatory factor for aggregate hedge fund returns, but with the opposite sign, i.e. hedge funds tend to bet not on, but against the low-volatility anomaly. This finding has several important implications. First, it implies that limits to arbitrage are not the key driver of the low-volatility anomaly. Second, it argues against the notion that the anomaly may be disappearing or may have turned into an ‘overcrowded’ trade. A final implication is that the return difference between low- and high-volatility stocks should be recognized as a key explanatory factor for hedge fund returns. "There is a vast amount of evidence that low-volatility and low-beta stocks earn higher returns than predicted by the Capital Asset Pricing Model (CAPM). Blitz, Falkenstein, and van Vliet (2014) provide an extensive overview of the various explanations for this phenomenon that have been proposed in various streams of literature. One of the most popular explanations is that the anomaly results from limits to arbitrage, such as leverage, short-selling and benchmark constraints. Leverage, short-selling and benchmark constraints may indeed prevent a lot of investors from exploiting the low-volatility anomaly, but such limits to arbitrage are much less of a concern for hedge funds, as these funds tend to be characterized by an absolute return objective and ample flexibility to apply leverage and shorting. Based on the limits to arbitrage explanation one would therefore expect hedge funds to be the smart money that actively takes advantage of the opportunity provided by low-volatility stocks. This paper empirically tests this hypothesis by regressing aggregate hedge fund returns on the return difference between low- and high-volatility stocks. The main finding is that the return difference between low- and high-volatility stocks is indeed a highly significant explanatory factor for aggregate hedge fund returns, but with the opposite sign, i.e. hedge funds do not bet on, but against the low-volatility anomaly. This argues against limits to arbitrage such as leverage, short-selling and benchmark constraints being the main explanation for the low-volatility anomaly. The finding that the multi-trillion hedge fund industry is not arbitraging but contributing to the low-volatility anomaly also argues against the popular notion that the anomaly is disappearing or becoming an ‘overcrowded’ trade. The findings in this paper also have implications for the hedge fund performance evaluation literature, as the return difference between low- and high-volatility stocks turns out to be a stronger explanatory factor for hedge fund returns than many previously documented factors." Using data for five major stock market declines during the 1987-2008 period, this paper provides evidence that value stocks are generally less sensitive to major stock market declines than growth stocks, controlling for beta, firm size, and industry group. Further analysis using several hundred different significant market move events between 1980 and 2015 confirms the observation that value stocks tend to outperform both the market average and growth stocks during market declines. The implication for investment practitioners is that following a value strategy does not lead one to assume greater sensitivity to unfavorable market conditions. "We conduct our study using data for five major stock market declines during the 1987-2008 period and several hundred stock market declines during the 1980-2015 period. For our core analysis, we selected a representative sample of five of the largest consecutive days of market decline in the S&P 500 index. We use a combination of three ratios: dividend to price (dividend yield), market to book, and earnings to price (earnings yield). We classify a stock as a 'growth stock' if it pays no dividends, has an above-median market to book ratio, and a below-median earnings yield. We classify a stock as a 'value stock' if it pays dividends, has a below-median market to book ratio, and an above-median earnings yield. Our research makes several important contributions to the literature. We document a consistent pattern of lower than average sensitivity of value stocks to most stock market declines, in excess of that predicted by beta. We also document that growth stocks have a greater sensitivity to most major stock market declines. We find that the decline of 2008 was distinct from the other major stock market declines in our study, wherein equities across the value-growth continuum were evenly affected. Further analysis using several hundred different significant market move events between 1980 and 2015 confirms the observation that value stocks tend to outperform both the market average and growth stocks during stock market declines." We seek to describe the broad cross-section of average stock returns. We follow the APT literature and estimate the common factor structure among a large cross-section containing 278 decile portfolios (associated with 28 market anomalies). Our statistical model contains seven common factors (with an economic meaning) and prices well both the original portfolio returns and an efficient combination of these portfolios. This model clearly outperforms the empirical workhorses in the literature when it comes to pricing this broad cross-section. Augmenting the empirical models with new factor-mimicking portfolios, based on APT principles, significantly improves their performance. tability and investment-based (in particular, several forms of accruals) anomalies. Following such evidence, several questions naturally emerge in the empirical asset pricing literature: How many factors do we need, and what are these factors, to describe well the broad cross-section of stock returns? To which dimensions of the cross-section of stock returns are these factors more correlated? To what extent (and how) can we improve the current multifactor models proposed in the literature in order to achieve a better description of large-scale cross-sectional risk premia? This paper attempts at providing answers to these questions. In order to achieve this goal, we adopt the general framework of the Arbitrage Pricing Theory (APT). fic cross-section of stock returns, against which the existent models are compared. rms that the statistical model is a successful APT. t of the seven-factor APT, suggesting that these models have a large room for improvement in terms of describing large-scale cross-sectional risk premia. ficant room for improving the existing empirical multifactor models in terms of explaining the large cross-section of stock returns in a way that is consistent with the APT."